I think I might have mentioned a time or two in the past couple years how much I love Shannon Hale. In case I haven't, I love her books. I could hug them. Please don't think I am strange. 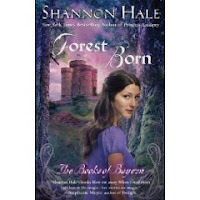 Forest Born is the fourth book in the Bayren series. Rin, the main character in this book is the youngest sister to Razo (River Secrets). After spending her whole life in the forest with her family she feels something is wrong or "bad" about herself so she leaves with Razo for the city - where she finds herself joining the "fire sisters" on a new adventure. I think out of all the special powers and main characters that Shannon Hale has created that Rin is one of my favorites. I was drawn to the idea of her abilities and all of us at one point or another in our life really need to dig deep and find out who we really are and what we are about. I am glad that Rin was able to find true self in this book and through her journey. I know both boys and girls that love these books and while their target audience is for young adult or even pre-teen I think anyone of any age can enjoy the stories, adventures and lessons that Hale shares with us. I think if I could pick an author I would want to be for a day, it would be Shannon Hale.